From the main menu when "Play" is highlighted, press your Left button and Lain's eyes will be selected. Click enter on the eyes for the feature. Four screens are shown, the first has Japanese text on white background like a film reel. The second screen is of "Close the World. .txeN eht nepO". 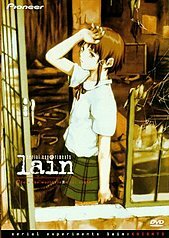 The next two screens are Manga drawings of Lain.